TORONTO (AP) -It seems like old times for the New Jersey Devils. Near-perfect goaltending from Martin Brodeur and a whole lot of close wins. Brodeur made 42 saves, and Zach Parise scored with 48.3 seconds left to give the Devils a 2-1 victory over the Toronto Maple Leafs on Saturday night. Parise, who also scored Friday night in New Jersey's 2-1 overtime win against Tampa Bay, has five goals in three games - all victories. The Devils stayed one point ahead of Montreal atop the Eastern Conference. He also scored twice in New Jersey's 4-1 win at Toronto on Tuesday that snapped the Devils' three-game skid (0-2-1). Brodeur stopped 143 of 149 shots during four victories over the Maple Leafs this season, including both this week. "It was the same as a couple days ago, they threw everything at us," Brodeur said. "They're a team that desperately needs points and they're playing like a desperate team. They're playing well, they could've won the two games we played them, but we were strong enough on defense and got enough offense." Mats Sundin scored for the Maple Leafs, who fell eight points behind eight-place Philadelphia and the playoff cutoff in the East. "Every loss for us makes our battle tougher," forward Alex Steen said. 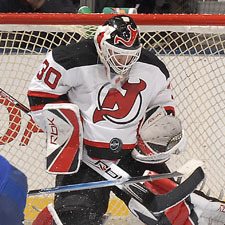 Brodeur was at his best during the third period when the Devils weathered a frantic push for the tying goal. Parise put New Jersey ahead 2-1 by shoveling the puck under Vesa Toskala after it looked as though the referee could have stopped play. "I knew he didn't have a hold of it," Parise said. "Just to see it kind of sitting there, and everyone with their sticks up, I was kind of surprised to see it sitting there between his legs." The Maple Leafs thought they should have come away with a tie and a power play. "When a guy drives your goalie, it should be a penalty," Leafs coach Paul Maurice said during a brief postgame news conference. "It's not a matter of a whistle, it's a matter of a penalty." Brodeur made that winning goal possible by stopping the first 36 shots he faced. Sundin ripped No. 37 past him at 13:44 of the third period during a power play. The Maple Leafs captain has points in eight straight games. His goal triggered a loud ovation from an announced crowd of 19,469 that was quite a bit smaller than that due to a large snowstorm in Toronto. It didn't faze the Devils, who are used to playing tight games. "Big win, big comeback from a late goal that they scored," Brodeur said. "They were good offensively, a lot of chances, but we stayed with it and didn't panic when we got scored on. I thought the guys did a good job." Toronto carried the play from the start, establishing a presence in the Devils zone and hitting a post behind Brodeur three times in the first period. "We beat him a few times, but couldn't beat the post," Steen said. Parise opened the scoring for New Jersey after Leafs defenseman Pavel Kubina was penalized for holding. Jamie Langenbrunner carried the puck hard to the net and skillfully avoided bumping Toskala as Parise fired a shot in the empty side at 11:19 of the first period. Brodeur was brilliant at the other end, stopping all 15 shots in the frame. It was more of the same in the second as the Maple Leafs failed to beat Brodeur on any of their 12 shots. "He's been the cornerstone of this team for years," Devils forward John Madden said. "Three Cups, and that's why he's the best in the biz." Notes: Toskala has started for Toronto in 25 of 26 games (14-9-2). ... Brodeur has made 28 straight starts. ... The last time the Devils missed the playoffs was 1995-96.